Commander of 7th Army Training Command, Brig. Gen. Tony Aguto, left, and U.S. Army Garrison Bavaria Garrison Commander, Col. Lance Varney, right, recognize Edward Pontoon for his 50 years of service to the U.S. government. U.S. Army photo. 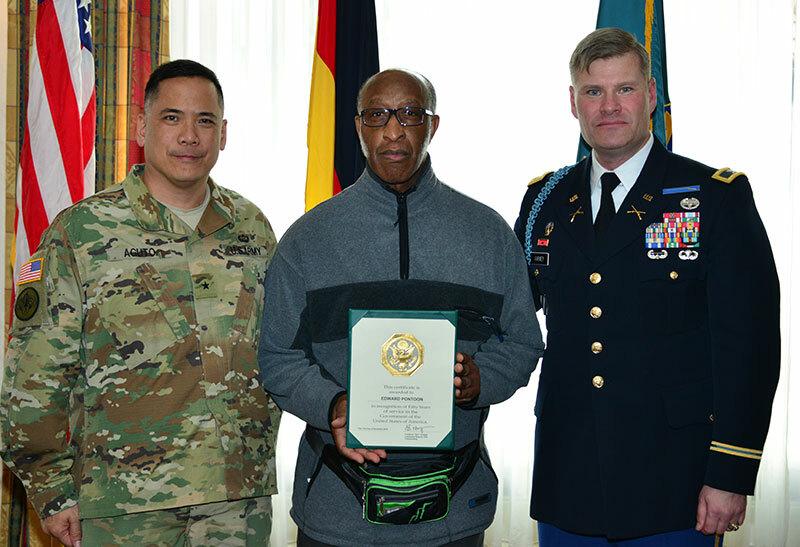 GRAFENWOEHR, Germany — The 7th Army Training Command legal community celebrated Edward Pontoon’s 50 years of service to the military March 30. Pontoon, after working as a claims examiner in Germany, officially retires March 31. His 50 years of service began when he was drafted for service during the Cold War. After being drafted on Nov. 21, 1966, Pontoon was inducted into the U.S. Army as an infantryman (11B). He served in Korea and completed three tours of combat duty in Vietnam. He then transitioned to being a wheeled and track vehicle mechanic (63 C/B). In 1975, Mr. Pontoon was first assigned to Vilseck, Germany, as a wheeled and track vehicle instructor at the 7th Combined Arms Training Center. After various assignments in the U.S., he returned to Germany in 1989 to assume duties as a Battalion Command Sergeant Major in Wertheim. He prepped and deployed with his battalion to Southeast Asia in support of Operation Desert Storm. In 1992, Mr. Pontoon retired from Active Duty and began working as a non-appropriated fund employee in Grafenwoehr, Germany. In September of 1995, then-Lt. Col. Scott Black, later the Army Judge Advocate General, hired Pontoon as a claims examiner for the Rose Barracks Law Center in Vilseck, Germany. Pontoon had a two year break in claims duties when he moved to Washington D.C. to serve as a paralegal at the U.S. Army Legal Services Agency Litigation Division. In May of 2003, he returned to claims examiner duties in Ansbach, Germany. Pontoon returned to Vilseck and his claims office at the Rose Barracks Law Center in January of 2007, where he has been ever since. All of his years of active duty and civilian experience culminated in leading his office to the Judge Advocate General recognizing Mr. Pontoon’s office with the prestigious award for excellence five years in a row, from 2010 to 2015. On March 31, 2017, Edward Pontoon officially retired after completing more than 50 years of government service. For his outstanding outreach efforts, for his willingness to share best practices as an instructor at U.S. Army Europe and 7th Army Training Command events, and for his great achievement in winning the prestigious claims excellence award five years in a row with the Rose Barracks Law Center, the 7th ATC Commander, Brig. Gen. Tony Aguto, awarded Mr. Edward Pontoon with the Commander’s Award for Civilian Service, which was presented at his retirement ceremony. For outstanding service from September 1995 to March 2017. You distinguished yourself by providing world-class claims service to the 12th Combat Aviation Brigade in Ansbach and the 2nd Cavalry Regiment in Vilseck, Germany. Capping 50 years of service, you distinguished yourself by performing duties well beyond the requirements of your position. Your outstanding outreach efforts, willingness to share best practices as an instructor at training events, and great achievement in winning the prestigious TJAG’s claims excellence award five years in a row, 2010-2015, reflect great credit upon you, the Seventh Army Training Command, and the United States Army.